Almost fifteen years ago, because of the phenomenal growth in the power of computer simulations, The University of Georgia formed the first institu- tional unit devoted to the use of simulations in research and teaching: The Center for Simulational Physics. As the international simulations community expanded further, we sensed a need for a meeting place for both experi- enced simulators and neophytes to discuss new techniques and recent results in an environment which promoted extended discussion. As a consequence, the Center for Simulational Physics established an annual workshop on Re- cent Developments in Computer Simulation Studies in Condensed Matter Physics. This year's workshop was the thirteenth in this series, and the con- tinued interest shown by the scientific community demonstrates quite clearly the useful purpose that these meetings have served. The latest workshop was held at The University of Georgia, February 21-25, 2000, and these proceed- ings provide a "status report" on a number of important topics. This volume is published with the goal of timely dissemination of the material to a wider audience. We wish to offer a special thanks to the IBM Corporation for its generous support of this year's workshop. We also acknowledge the Donors of the Petroleum Research Fund, administered by the American Chemical Society, and the National Science Foundation for partial support. This volume contains both invited papers and contributed presentations on problems in both classical and quantum condensed matter physics. Illustrations note 3 Tables, black and white; 31 Illustrations, black and white; IX, 240 p. 31 illus. 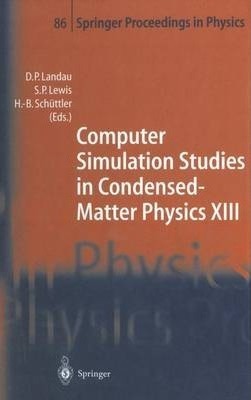 This volume is a "status report" based on the presentations and discussions which took place during the 13th Annual Workshop on Computer Simulation Studies in Condensed Matter Physics at the Center for Simulational Physics at the University of Georgia in February 2000. It provides a broad overview of the most recent advancess in the field, spanning a wide range of topical areas in simulational condensed-matter physics. These include recent developments in the simulations of classical statistical mechanics models, electronic structure calculations, quantum Monte Carlo simulations, and simulations of polymers. New physical results and novel simulational data analysis methods are presented. Computer Simulation Studies in Condensed-Matter Physics: An Introduction.- Computer Simulation Studies in Condensed-Matter Physics: An Introduction.- I Interacting Quantum Systems.- Spin Dynamics and Noncollinearity in Molecules and Crystals.- Ground State Properties of the J1-J2 Heisenberg Model: A GFMCSR Study.- Solving Sign Problems with Meron Algorithms.- Low-Temperature Thermodynamics of Quantum Systems.- The Dynamical Cluster Approximation: A New Technique for Simulations of Strongly Correlated Electron Systems.- II Methodology and Algorithms.- A Parallel Algorithm for Groundstate Search.- Simulation of Quantum Computers.- Avoiding a Pitfall in Dynamically Optimized Monte Carlo Method.- Morphological Image Analysis.- An n-Fold Algorithm for the Heisenberg Model: An Equilibrium Study.- III Defects and Disorder.- First-Principles Simulation of Oxygen Defects in Silicon.- Blocking and Persistence in the Disordered Ising Model.- Solution of the Multifluxline Ground State Problem in Disordered Systems.- Disorder-Driven Roughening Transition of Flux Lines in a Periodic Potential.- Non-Self-Averaging Autocorrelations for Quenched Connectivity Disorder.- IV Glasses and Fluids.- Domain-Wall Free Energy of Spin-Glass Models: An Extended Ensemble Approach.- Equilibrating Glassy Systems with Parallel Tempering.- High-Resolution Study of Fluid Criticality.- V Nonequilibrium and Dynamical Systems.- Simulational Study on Phase Transition Using Dynamic Behavior.- Nonequilibrium Surface Growth and Scalability of Parallel Algorithms for Large Asynchronous Systems.- Hysteresis in an Electrochemical System: Br Electrodeposition on Ag(100).- Molecular Dynamics Simulation of Nanocrystalline Pd under Stress.- VI Polymers and Complex Systems.- Langevin Dynamics Simulations of Polymers Near Fluctuating Surfaces.- Lattice Models of Amphiphilic Fluid Hydrodynamics: Simulations and Results.- Emergent Behavior in Many-Particle Systems.- List of Contributors.